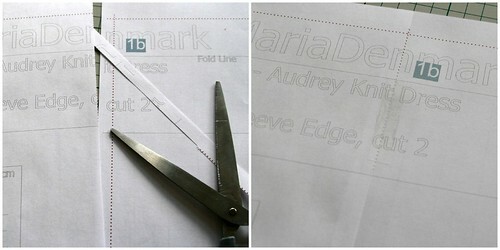 Meet Audrey B and Audrey C. The new MariaDenmark Knit Dress pattern(s). They look a lot alike. And they are almost identical twins. The only difference is that while Audrey B was drafted for the usual B cup (as almost all European and most American patterns are), Audrey C is optimized for a C cup (and sized accordingly). Both patterns will let you make a comfortable jersey dress (it’s my favourite thing to wear at the moment) that has enough structure, shaping and details for it to not look too casual. I’ve worn it to work in the fabric store (with flat ballet shoes), teaching (heeled boots and thick structured tights- it’s still winter here) and for family parties (pumps and thinner tights). And I’m looking forward to it being warm enough for me to wear it with sandals and no tights! I’ve worked a bit with the pattern layout, and have found an even better way to make it easy to print and assemble the pattern: Now I have included red dotted boundary lines to make it easy to see where to cut and overlap the pages before you tape them together. And the grid lines are still there as well. What else can I say about this pattern? It’s knee length (I hemmed it a little shorter because I wanted to wear this version with flat shoes, and then I need the hem to hit above the knee), it’s versatile for both prints and plain jerseys (I’m dreaming of one in a raspberry jersey with blue edges). It takes 1.5 m – 2 m of fabric. It’s a fast sewing project. It’s a great dress. Oh, and you can of course get it at MariaDenmark.com (Audrey B is here and Audrey C is here) and on Crafsy.com (Audrey B on Craftsy – Audrey C on Cratsy) – and on Patternreview.com! PS. The pattern name, Audrey, came from Vicki Kate, who suggested it in a previous post. Thank you Vicki Kate! Gorgeous! I love jersey dresses – so easy to wear – so this is definitely on my list! Thank you! Glad to hear it! It is a great dress. I will have to make lots more for summer! I love it. It will be soooooo great for Australia. You had me at “Hello”. I think I sprained my right hand clicking finger, moving as fast as I did to order. Pattern obsession is dangerous and not for wimps. As usual lovely! Might have to move this up my sewing list:) thanks for the larger cup sizing, makes it much easier! Thank you! Looking forward to seeing your version! What a great pattern! I love this style!